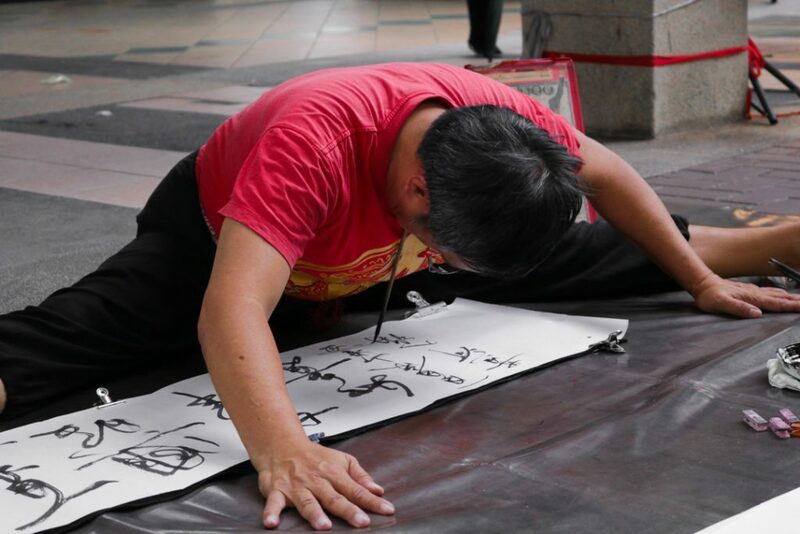 Meet the unconventional street performer who merged yoga with calligraphy. With a brush in the left hand and another in the mouth, he bent over in a split position. The brushes gracefully danced across the calligraphy paper. Once completed, he sat back up in an upright position and presented the piece to the anticipating audience. The Chinese characters read, “腾飞”, which means to go far. A huge round of applause ensued in 3155 Commonwealth Avenue West. The characters were the reason why Tan Hong Jiu did calligraphy in yoga postures. 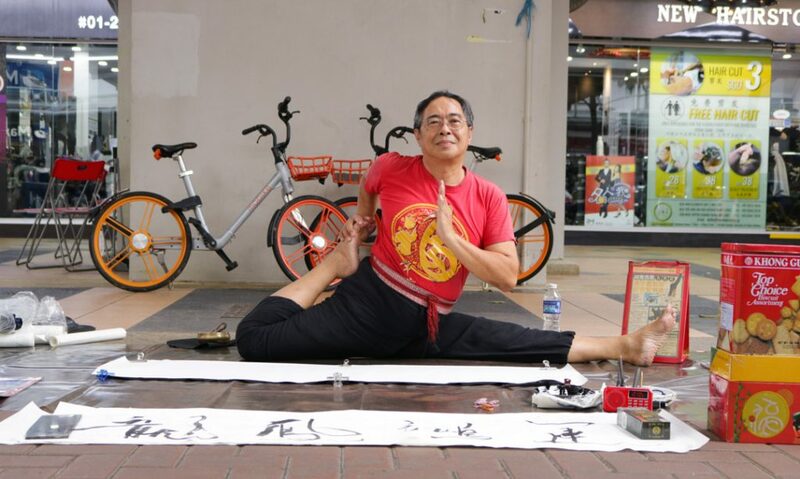 Mr Tan Hong Jiu, 62, being as flexible as the tip of a calligraphy brush. Photo: Poh Yeng Harn. Beneath the smiley demeanour lies a fearless dreamer. The 62-year-old once laid down on a bed of glass shards in a non-upright position as the brush in between his toes moved smoothly across the paper. He had no protective gear and this happened on the stage of a talent show that was broadcasting live worldwide on China Central Television. The audience held their breath, eyes fixated on his fluid movements. Deafening cheers echoed through the hall when Mr Tan stood back up on the stage and held up the artwork with a satisfied smile. Mr Tan first picked up yoga from newspaper articles at the tender age of 8. He added acrobatic tricks on his own and soon started somersaulting around in the house. Aside from yoga, Mr Tan always had a passion for calligraphy and constantly practiced at home with guidance from his sister, the then president of the calligraphy club in her secondary school. However, being skillful was not enough for the ambitious Mr Tan. He wanted something that would set him apart from the norm and he finally got the answer to his problem after a faithful encounter with a reporter during one of his morning exercises at Bukit Timah Hill. “He said I was good in yoga, but I am no different from the norm, unless I can perform calligraphy in yoga postures,” Mr Tan described. Ever since, Mr Tan never stopped practicing but Rome was not built in a day. It was tough to even hold the brush in place with the toes, let alone maneuvering it. His wife was not supportive of him. Kwek Yue Kai, 65, said, “I told him, there are many people in China who can do this. You aren’t any special”. However, he never thought of giving up, not even once. Her words fell deaf on the determined elder as he continued to work hard and finally, he was satisfied. However, his wife was still skeptical. “You cannot earn money with that skill and if it cannot earn money, it’s useless in Singapore,” said Madam Kwek. Those words hit Mr Tan hard then. The costs of calligraphy paper, ink, and other expenses for his passion flashed by in his mind. He approached different talent companies in hopes to land a contract but all he ever got was rejections. Performing on the streets was his last resort. “My sister said it was low class to perform on the streets and it would be difficult to get famous but what other choice do I have?” Mr Tan recounted. He liked performing for people and the odds were clear to him. Performing on the streets would guarantee an audience and a small income. It was better than anything he had then. Mr Tan debuted on the streets at 48. Initially, the audience had mixed feelings about him. Some called him talented, others said otherwise but gradually, Mr Tan disregarded those who did not know how to appreciate his works. “It’s very refreshing because it’s not an easy feat,” said Michelle Lim, 25, a calligrapher who was part of Mr Tan’s audience. “The biggest challenge was to write the Chinese characters in an upside down orientation, I practiced so much till the characters on the streets look incorrect to me,” said Mr Tan. Mr Tan performs the most difficult trick in his book – writing the characters in another orientation. hospitalized for 4 days. Reluctantly, Mr Tan took a break for 4 days before getting back onto the streets. It was resilience that got Mr Tan from the streets in Clementi to the global stage in China. At the age of 62, he still has strong dreams to be the holder for at least 3 Guinness World Records and does not plan to stop performing till time tells him so.